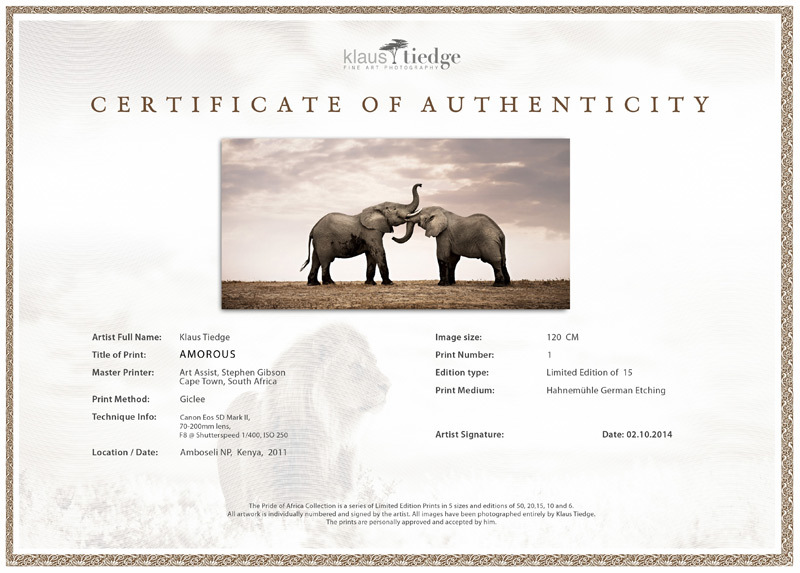 Personally numbered, signed and authenticated by artist Klaus Tiedge. Amazing photograph of a hippo raising out of the water while a bird is landing on it. Cruising down the Chobe River in Botswana on a little boat with thick and lush vegetation seaming the rivers edge, my eyes saw this wonderful and favorite safari destination from a different perspective. Although the river is only some *** meters wide it feels like going down an avenue of mangroves in the jungle. This was an easy position to photograph as big mammals or predators come to still their thirst, yet proved to be an illusionary wish. For the next 2 hours we were just going downstream towards the Zambezi River junction. Even the boat floated as quiet as a paper boat going down a stream. Suddenly, we saw two little ears twirling out on the water surface … Hippos! I find these creatures far more appealing in the water yet they are hard to capture as they usually only appear for a wink moment before they disappear under water again. I checked through the viewfinder of my already set camera. I did not saw the right position for a photograph; so I laid down on the wooden planks, resting my camera on the boats rim. What happened next was a true coincidence of right time and place. We must have reached a shallow part of the river or else I cannot explain what happened in front of our eyes. With a loud snort a colossus of a hippo heaved up that much above the water surface that we could see half his body sticking out. Witnessing this moment with my camera, I was taken by surprise when I thought this special moment was already a top hit! At the exact same moment when the hippo lifted out of the water a *** bird used its back as a landing bridge. Timing and position could not have been better! 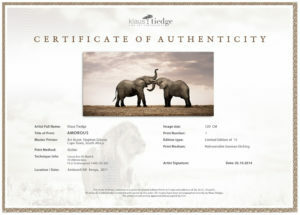 As our standard we are using Giclee printing method on high quality archival fine art paper e.g. Hahnemühle German Etching, Epson Cold Press paper.